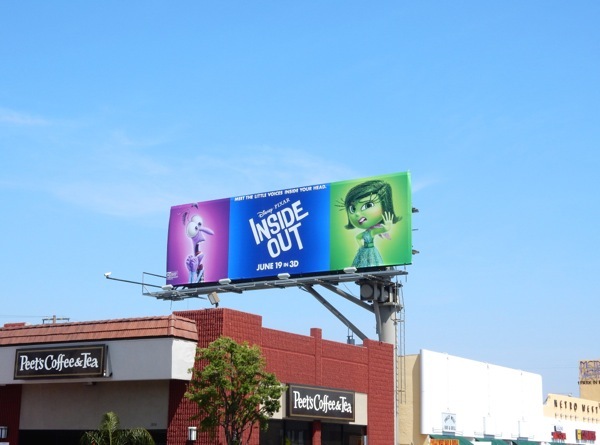 This past month things have been pretty grim in the skies of L.A. with the advent of the annual dreary 'May grey' fog and general lack of traditional California sunshine, hooray then for these vibrant Inside Out movie billboards to help brighten the city skyline and lift all our spirits with a riot of colour and emotions. 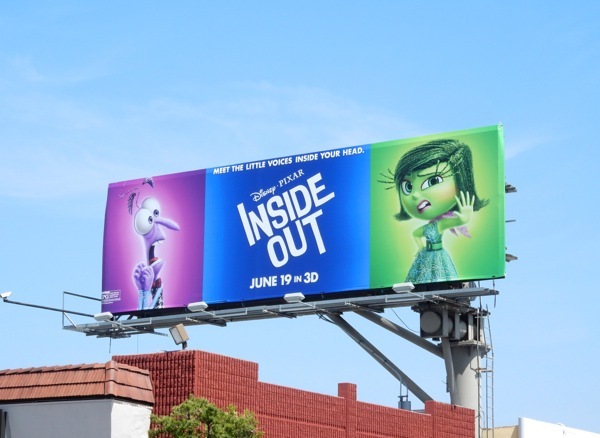 Yes, these outdoor ads are bringing 'Joy' and all the other voices inside our heads, like 'Fear', 'Disgust', 'Anger' and 'Sadness' in Disney/Pixar's latest heartfelt animated outing. 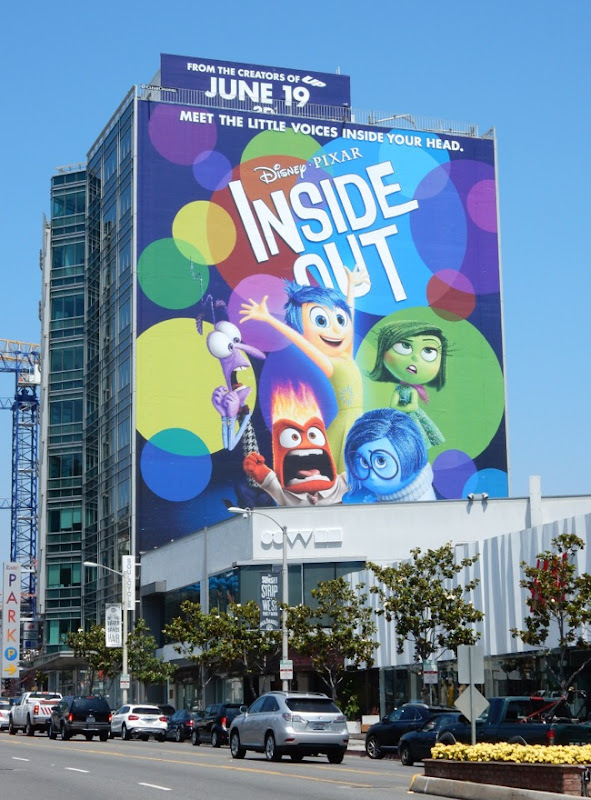 In this latest animated tale a happy 11-year-old girl has her world turned upside-down when she and her parents move from the Midwest to San Francisco. 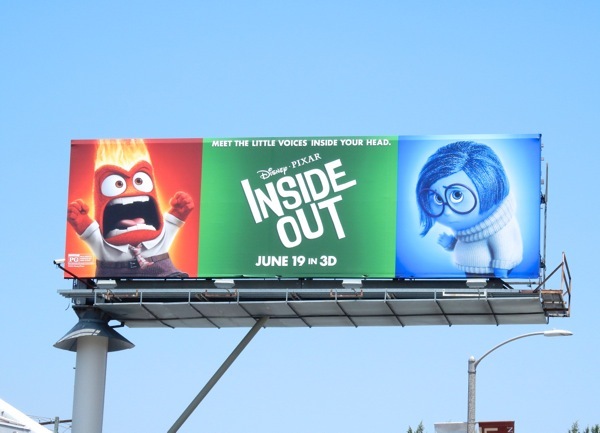 'Riley's' emotions, led by Amy Poehler's Joy, try and help her navigate through this time of upheaval, but the stress brings Phyllis Smith's Sadness to the forefront and when the two emotions are swept into the far reaches of Riley's mind, all that's left inside her head's HQ are negative feelings of Anger, Fear and Disgust (voiced by Lewis Black, Bill Hader and Mindy Kaling, respectively). 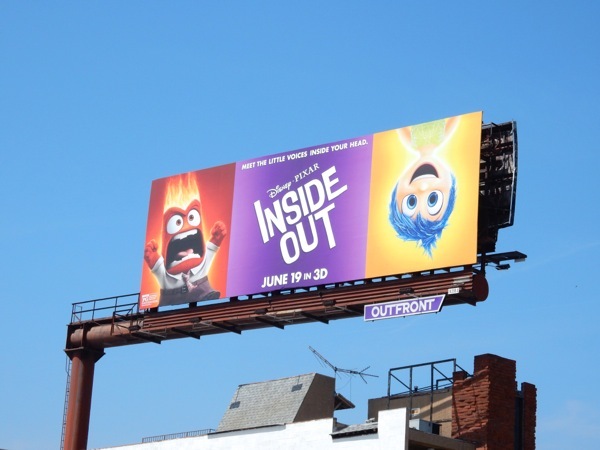 It sounds like a fun premise in the same vein as past cinematic successes like Toy Story, Finding Nemo, Wall-E and UP. 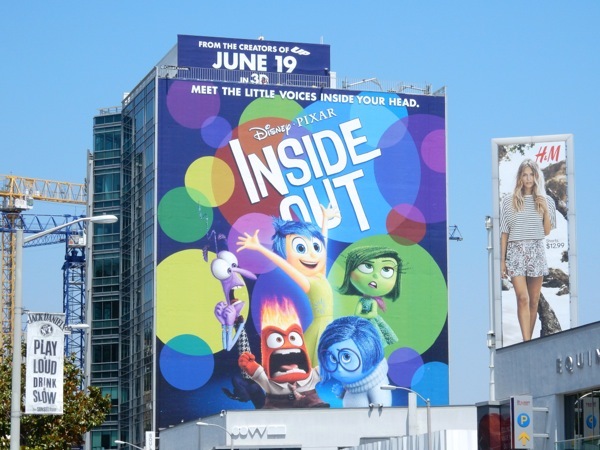 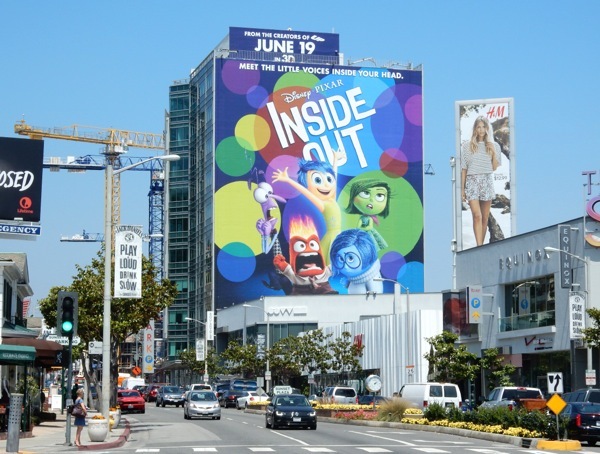 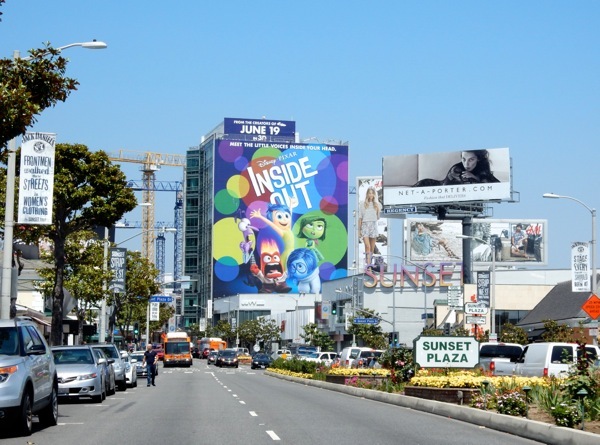 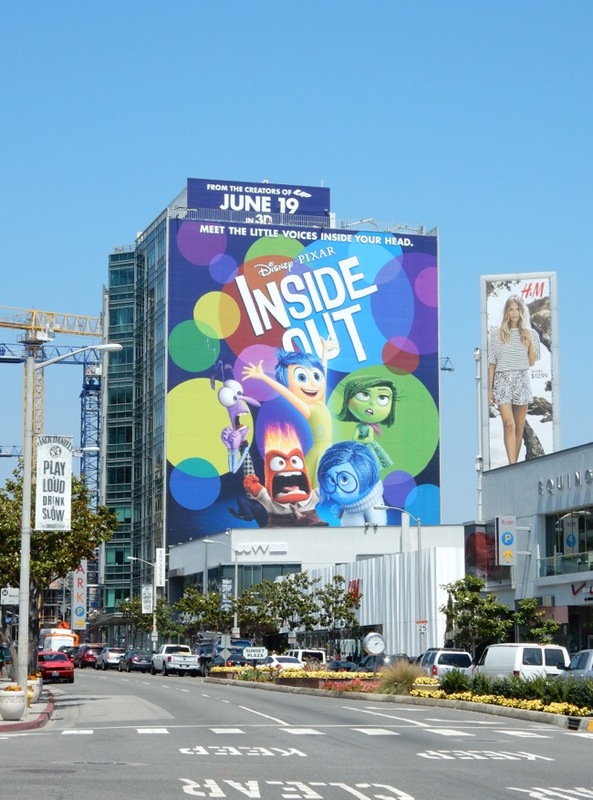 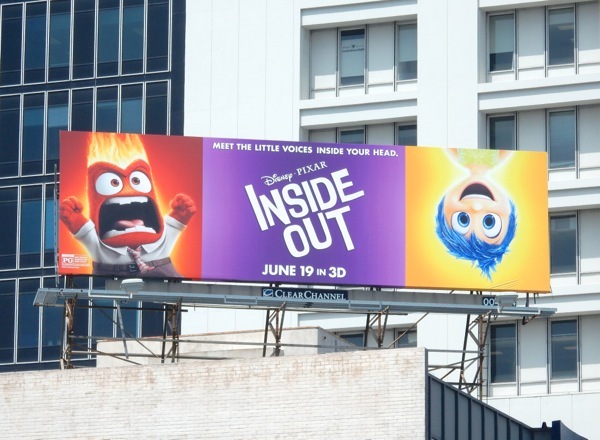 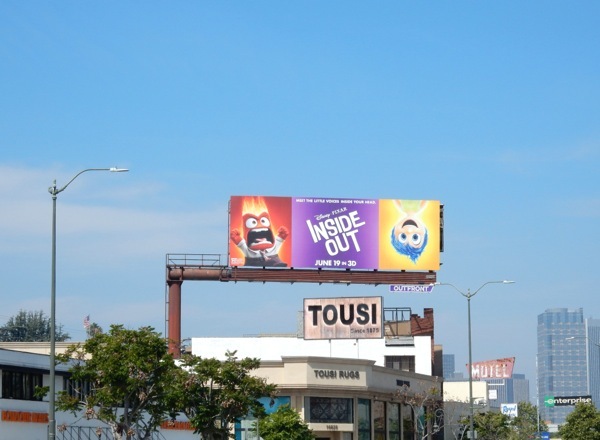 This super-sized billboard for Inside Out was spied dominating the Sunset Strip skyline on May 27, whilst the landscape ad creatives showcasing the different character emotions from the film were snapped along Melrose Avenue, Santa Monica Boulevard, Wilshire Boulevard and Westwood Boulevard from May 27 to May 29, 2015. 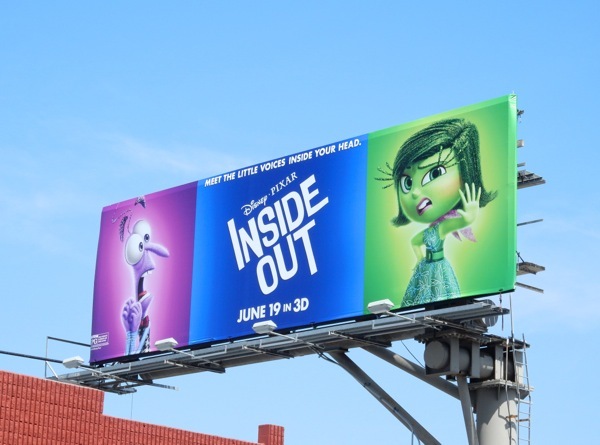 If you're an animation fan, be sure to also check out these other Disney/Pixar movie billboards and more filling L.A.'s skyline in recent years. 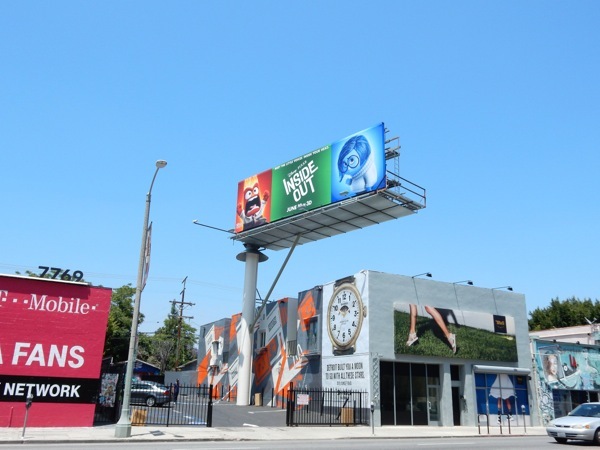 How can you not feel happier after seeing all these bright, fun billboards, it's the perfect way to start your working week. 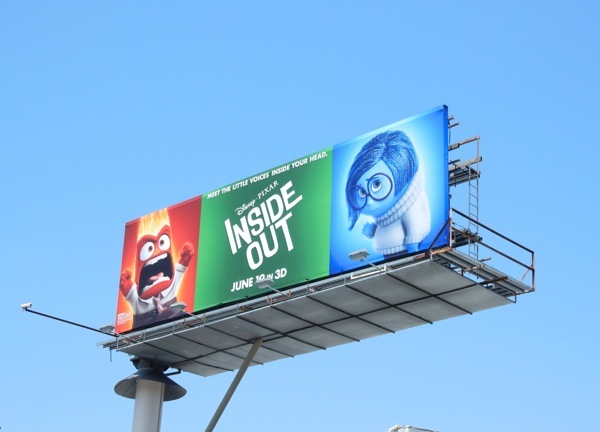 Don't let fear, anger, disgust and sadness rule your emotions this week, in fact let's hope you can see the joy in life all around you (at least until this movie opens in cinemas). 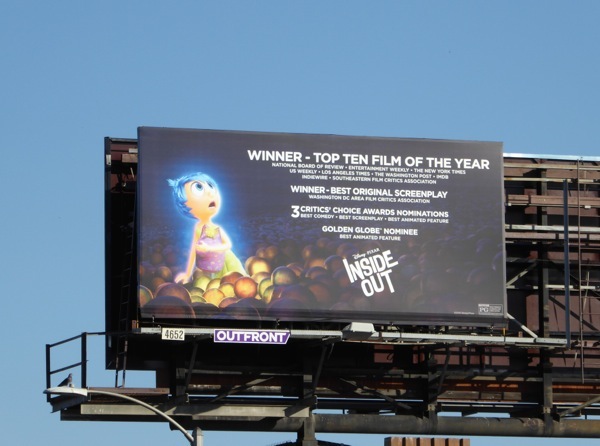 UPDATED: Inside Out certainly stirred emotions and stole hearts at the box office this year, but can the animated picture now steal some industry accolades this awards season? 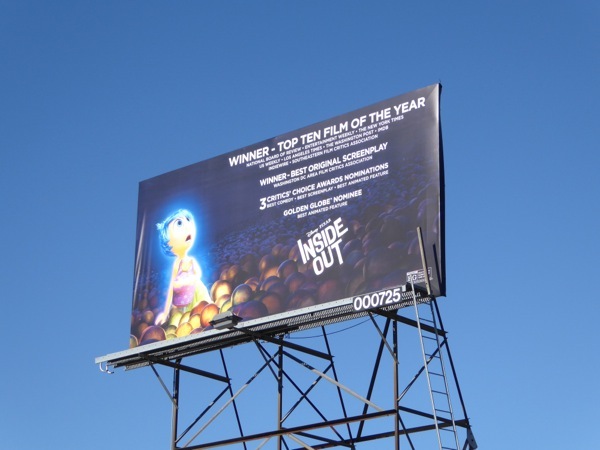 This awards consideration billboard featuring Joy was snapped along La Cienega Boulevard on December 26, 2015, plus above Melrose Avenue on January 2, 2016. 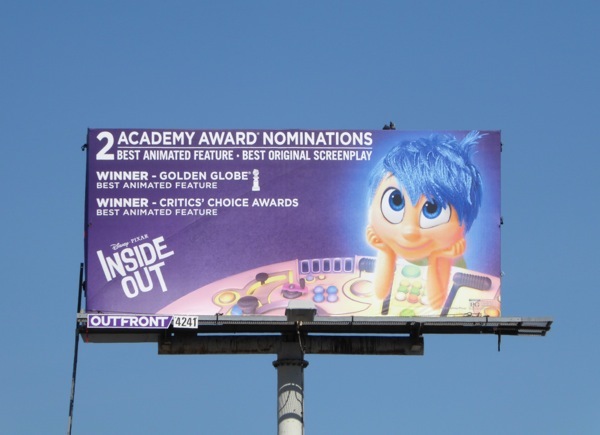 UPDATED: Now that Inside Out has taken home the Golden Globe and Critics' Choice Award for Best Animated Feature, it's time for Disney/Pixar to concentrate on the upcoming Academy Awards. 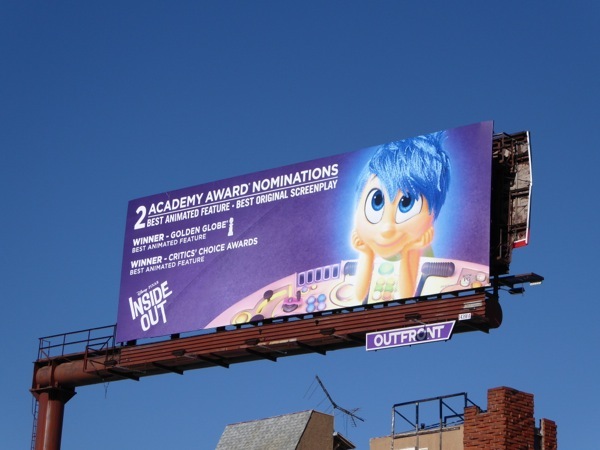 This Oscar consideration billboard, once again featuring Joy, was snapped along Highland Avenue at Santa Monica Boulevard on February 3, 2016. 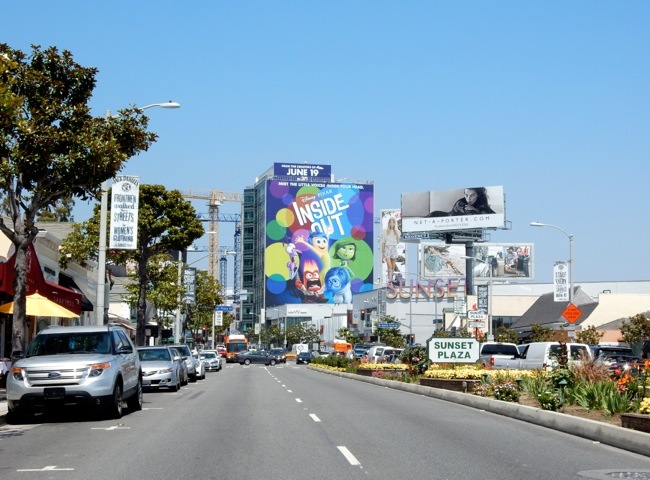 And here's a larger landscape billboard spotted along Santa Monica Boulevard near Westwood Boulevard on February 6, 2016.